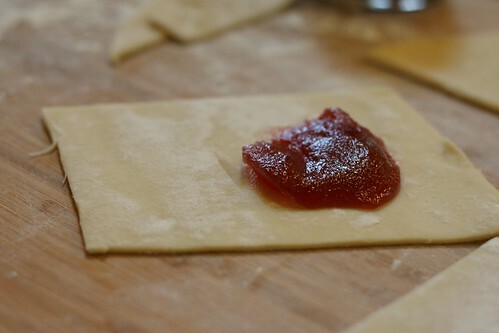 honey & jam | recipes + photos: Homemade Pop Tarts! These are SO easy, and SO good, much much better than those boxed kind. They also aren’t expensive! 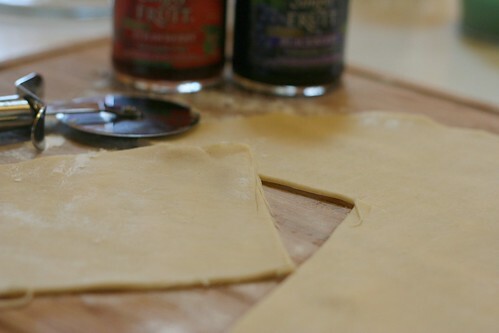 2 pie crusts (I used boxed, but you could make your own. 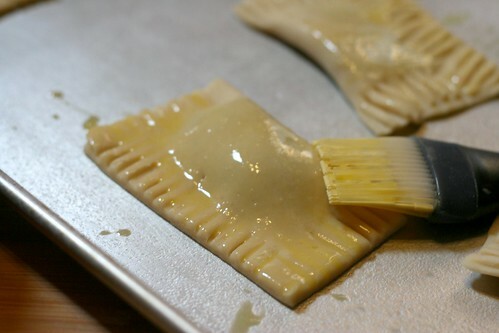 then you’ll have to cut off some of the edges to make them square. 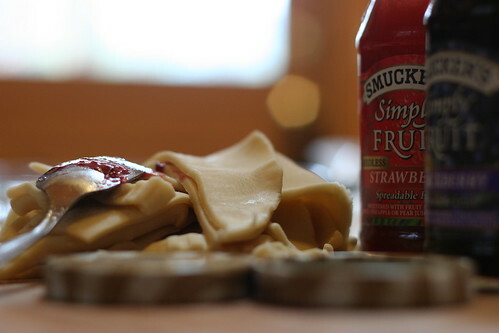 place a big ol’ dollop of jam towards one side. 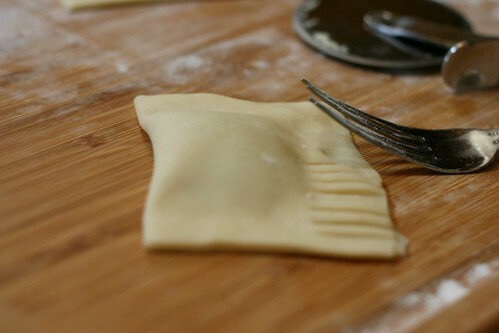 then wet your finger and run it along the sides of the dough, this is very important, it helps it stay closed. When you’ve done that, press down the edges with a fork. Then egg wash and sprinkle with raw sugar. WHICH I FORGOT TO DO. dang. Bake at 350 for about 10-15 minutes, until golden brown. Enjoy! Warning: These are quite addictive. You may eat them all. And then want more. I love it! They look delicious. As I read your blog post, I was thinking, "I bet that would be reallllllly good with Nutella in it!" It seems to be a popular response. I'll have to try it! Nutella sounds amazing, I actually thought about trying that, but I feared it may just burn instead of bake...based on a nutella muffin attempt that went awry! Those nutella turnovers sounds amazing though! oh, I have to make some of these--my kiddos will like them but I will love them. such a great idea to share. thank you. oh yum, it's like a dessert empanada. mmmmmm. oh i am so doing this! Yum! All the fun of Pop Tarts without all the fake additives and trans fats - Sweet! These are so cool. What a great idea! These look awesome! Do you think it would turn out okay if I added a little peanut butter inside for some protein? I'm sure that would come out fine! These are not pop tarts. Pop tarts go in a toaster. And then pop out of it. Hence the name. 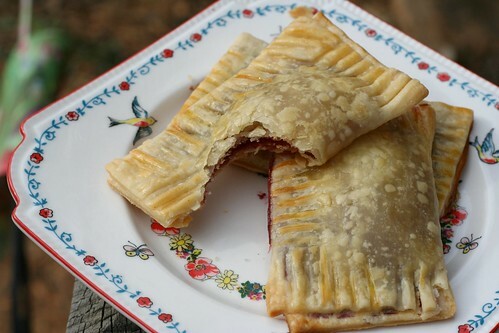 Call them mini-fruit-pies if you must, but don't slander the name of the most perfect of foods, the deliciously full of chemicals and transfats pop tart, with this weak imitation. 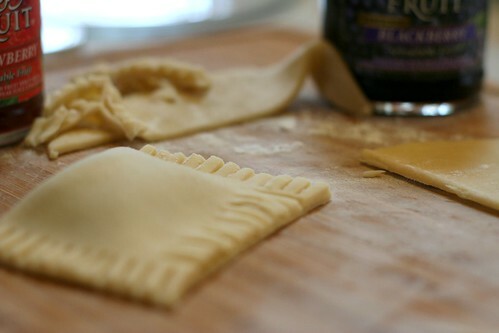 I have seen about a dozen recipes for pop tarts on the web but so far all of them are like the ones in the store, I like the flaky look of this a lot more, I will have to try it out. i just saw your peanut butter pop tarts on a different site and holy cow! Why has no one put peanut butter in a pop tart before? Genius! Thanks so much! We made these and love them!